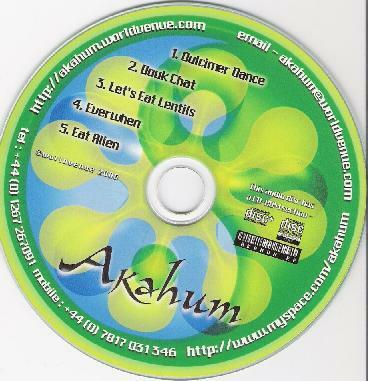 Akahum is a 3-piece band made up of David Unlimbo (guitars& synths), Paul Csordas (drums & percussion) and Lyndon Izzard (bass) from the band Unlimbo. Describing themselves as "Unlimbo's leaner little brother", the intention is to retain the fundamental Unlimbo sound but with a more back to the basics approach. The band are currently wrapping up a full length CD and this EP is a demo to hold us over until it's ready. Wow, talk about cosmic GROOVES! These guys are spot on when they describe themselves as "cool, spacey sounds with an ethnic flavour". "Dulcimer Dance" has a great toe tapping rhythmic pulse, lead by a deep potent bass, varied percussion and the main melody line handled by… you guessed it… dulcimer! Very cosmic and accessible music that you can chill out to or even dance to. It makes the body want to MOVE! "Douk Chat" and "Eat Alien" take us into acid house territory with frenetic electro dance beats, space metal guitar, and cool voice samples. HOT dancey Space Rock! (I recall "Douk Chat" from one of the Unlimbo albums). "Let's Eat Lentils" has a spaced out salsa type feel with outstanding percussion and acoustic guitar. And "Everwhen" is a dreamy brain massage piece with atmospheric backdrops and synth waves and steady drumming. Really beautiful music to close your eyes and float away with. I hope the full length is ready soon because this is pretty hot stuff. Fans of Unlimbo, Ozric Tentacles and any other ethnic, dance, chill out flavored space rock band you can think of will surely dig Akahum. For more information you can visit the Akahum web site at: http://akahum.worldvenue.com. Hear Akahum at their Myspace page at: http://www.myspace.com/akahum.